@TestPropertySource is a class-level annotation that configures locations of property files and inlined properties in Spring integration test. The properties loaded by @TestPropertySource are added to the set of @PropertySource in the Environment for an ApplicationContext. 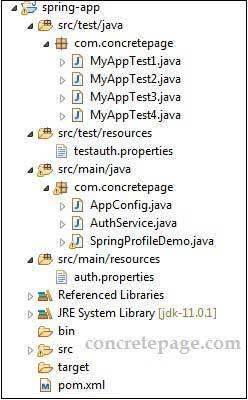 The properties loaded by @TestPropertySource have higher precedence over the properties loaded from Java system properties, operating system's environments, property sources added by @PropertySource or programmatically. So the test property files can be used to override properties defined in system and application property sources. The inlined properties loaded from @TestPropertySource have higher precedence over the properties loaded from resource locations using @TestPropertySource annotation in Spring integration test. Now find the elements of @TestPropertySource annotation. locations: Specify test property file locations to be loaded for integration test. properties: Specify test inlined properties to be loaded for integration test. value: It is the alias for locations element. inheritLocations: Boolean value to decide if test property source locations should be inherited from superclasses or not. inheritProperties: Boolean value to decide if test inlined properties should be inherited from superclasses or not. Example to specify property file locations. Example to specify inline properties. Now find the @TestPropertySource annotation example step-by-step. We are creating a sample application for the @TestPropertySource demo. Our application will use a property file with some properties. In our integration test class we will load a test property file that will override the properties of main property file. Find the main files of demo application. Now find a simple test class. In the above test class we will get test result using properties loaded by application from auth.properties file. Here we will create a test property file to override some properties of main property file. Now find the test class to load test property file using @TestPropertySource annotation. Look into the above code. We are loading test properties from testauth.properties using @TestPropertySource. The value of login.user and login.pwd properties will be loaded by application from testauth.properties instead of auth.properties file. The value of app.name will be loaded from auth.properties file. We can load multiple test property files using @TestPropertySource as following. We can load inlined properties using @TestPropertySource annotation in our integration test. In the above code we are loading login.user and login.pwd properties as inlined properties using @TestPropertySource annotation. In integration test the values of login.user and login.pwd will be loaded as specified in @TestPropertySource annotation and the value of app.name will be loaded from auth.properties file by application. Here we will provide demo of test classes that are loading property values specified by inlined properties as well as property file using @TestPropertySource annotation. We will create two test classes in which one class will inherit another class. As we know that inlined properties has higher precedence over the properties loaded by property file using @TestPropertySource annotation, so in the above example the value for login.user has been loaded from inlined property. The value for login.pwd has been loaded from testauth.properties file and the value for app.name has been loaded from auth.properties file. 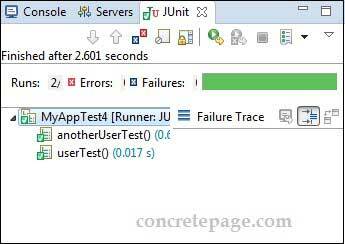 Find the print screen of the JUnit test output for above test file.